I have made so many trips to Chico and Magalia, that I can’t even begin to tell you how many. I want to tell you what you created. In the beginning, it was the Walmart parking lot, it’s smoke and the despair. It was about all the animals and their suffering. It was about $50 into somebody’s hand when they had nothing. It was about words that some times fell flat, such as “It’ll get better.” It was about frustration with the shelters opening and closing. It was about anger that something like this could even happen in the first place. And it was also about being pissed off that I couldn’t reach out to more people. It didn’t take long for me to realize in just a few days that this was not going to be a quick fix. I could not just roll into town with your donations and solve everybody’s problems. So, I started thinking as I always do within my business and that was to try to be a critical thinker. I knew that I could not do this work with the people of the Camp Fire without your help. I knew that every penny and every dollar had to be stretched. I also felt that to give out money that did not create a solution to an immediate need, a small step forward and hope was useless. So, with that, I readjusted after just a few days. With your help, I was in and out of parking lots, people’s RV’s and shelters almost daily. Finding people to help wasn’t the hard part. Coming up with ways to help people move forward was the challenging part. So many layers of the onion had to be peeled at times it was physically and mentally exhausting. What exhausted me at times the most was laying in bed at night and not being able to sleep. My mind is like a book and every page had a person on it with a different need and so at night I would read the book page after page to try to set up the next day. I’ve been self employed for many years and without the lessons of entrepreneurship, I don’t think I would have adapted or evolved to be able to keep up with an ever changing situation. I also don’t think I would have been able to keep going without all the support from family and everybody here at High-Hand, both of whom were thrust into the situation unknowingly as I did not announce what I was up to when I had put it out there. I have received many notes of thank you and support. I read them and I hold onto them. Your support, my family’s support as well as the wonderful people who work at High Hand has been there through all this to carry the day. 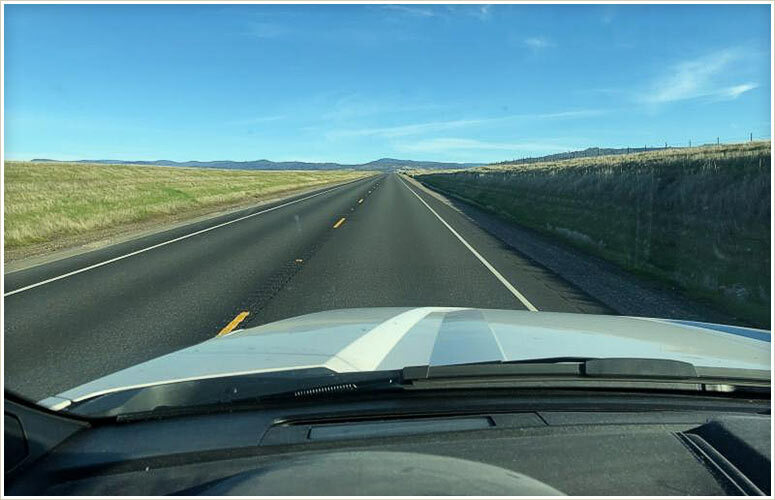 The drive up to Magalia starts out very peaceful as you pull off Highway 70. It doesn’t take long, once you make the turn onto Penze Road that the scenery changes. Within a short distance of just a few miles, everything changes. I wonder if things will ever get better. I have seen from the early days great things happen to people. I wish I could share them all with you and give you a window into those moments. I’ve tried to do this in these emails, but it really doesn’t do it justice. People have lost literally everything and your donations have managed to help people start lives over again. To bear witness to that and be able to provide those moments of hope has been a blessing that only came when you decided to help. The Red Cross shelter at Silver Dollar still has people that you and I are helping. I have a solution for a few and am creating solutions for others. I’m doing the best I can there. You can put out your finger many times and point to the way, but if the butterfly doesn’t want to land there, it’s heartbreaking. Today, we are continuing to feed people at Pastor Doug’s church. Water is a big issue up there and it pisses me off that the agencies are hit and miss. 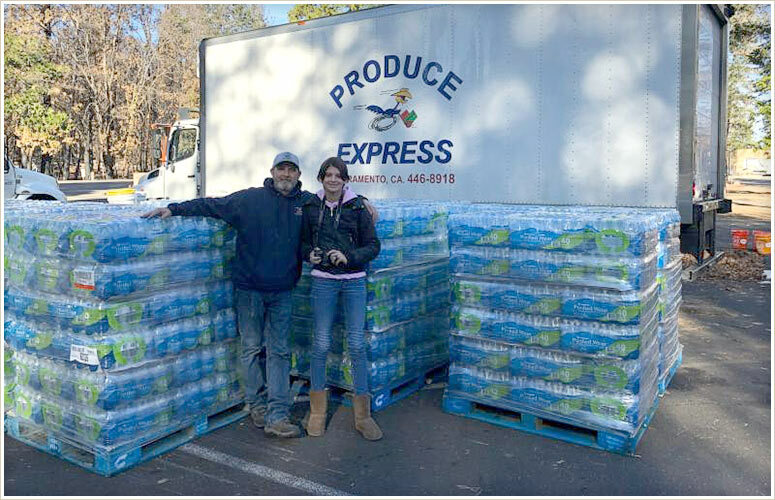 We have shipped 24 pallets of water to date on top of all the food and other items into Magalia. A truck load of water costs around $3,000.00. 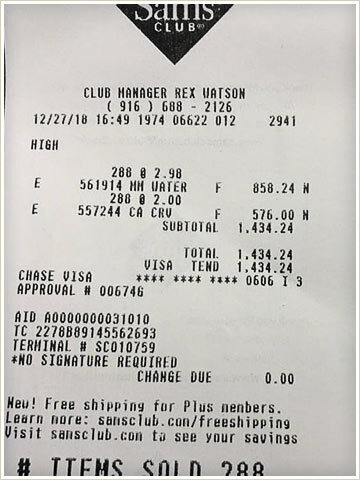 It’s nuts that I have to pay as much for the CRV as the water, but it is the best deal I can come up with so far. If anybody’s got any ideas, I’m all ears. A pallet costs about $250.00. We can fit 12 on a truck. When Doug calls me and I need to infill, I send a truck of water up. There is no word on when their water systems will be good again. Chico Walmart with kids has been living in a Rocklin hotel for about 5 weeks. From the shelter to the hotel she will start a new life. Tomorrow she and the children will be moving to Gathering Inn. I can’t thank them enough for making a six month commitment to her. She will continue to have access to services, counseling and assistance for her to move forward and put this behind her. I will be checking in. 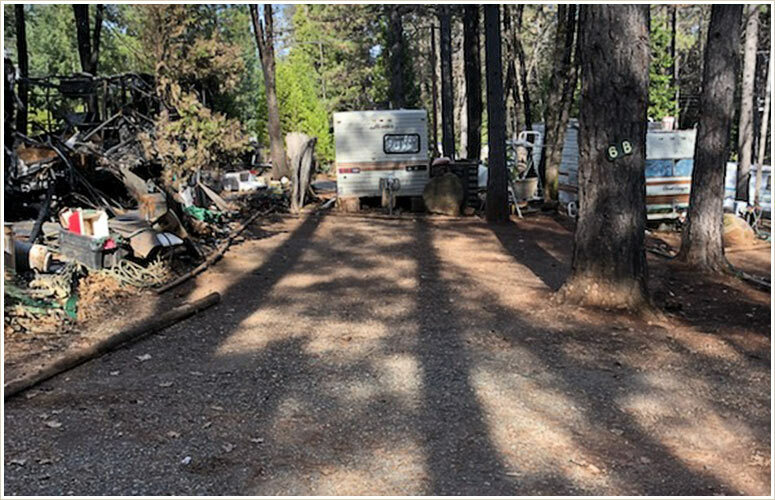 Chico Alejandro Oroville parking lot now has a job and a trailer to stay in. We helped fix a donated car thanks to you. We will be checking in as well. Chico Car Key Couple has a new special key for the car that was stolen at the shelter. Also insurance and registration that lapsed during the fire has been paid. They’ve been given a direction. 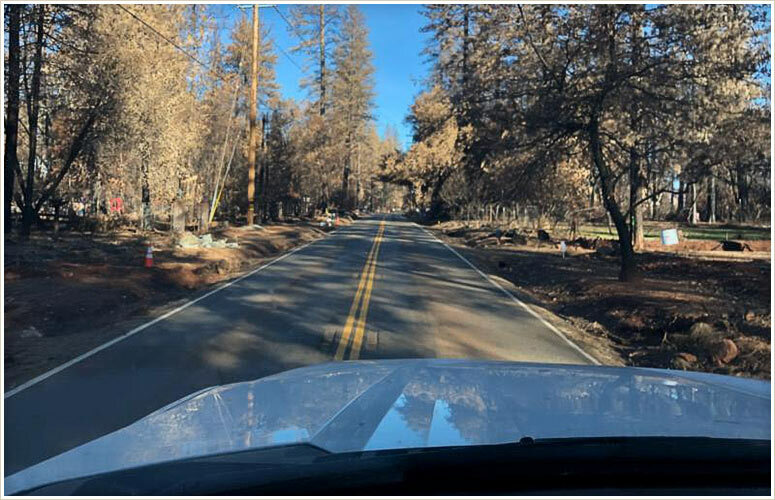 Chico Carolina escaped the fire. Her son has the scars on his back to prove it from the ashes that fell. She’s gone from the Gridley shelter to Red Cross Kim’s trailer park and now is moving into an apartment in Auburn. We were able to get her a donated car and get her into the apartment. She and her three kids are starting over. She will start a job at High Hand in the next few weeks. Chico Kurt Feed Store is continuing to distribute animal food to people we have talked to. Chico Daniel Wood Cutting has been cutting wood and donating it to people to get through the winter. It’s cold up there. Your donations continue to backfill his gas needs as they arise. Chico Diana needs a car. I’m trying to mentor her to clear up a ticket. She can then at that point get a car and her license back. She’s currently still at the shelter, safe and warm. Chico Greg with Kids has a home to go to in Magalia but still remains at the shelter. I am continually in touch with him, trying to mentor him to move along. Chico Jasmine Panda parking lot is now back in a home in Magalia. All is good. Chico Magalia Jesse Car Registration has his chainsaw and we have a job for him in Magalia if he wants it. I will be in contact with him tomorrow to keep him on course. Chico Tattoo Gloria and Ralph are meeting me at Southwest Airlines Sacramento tomorrow at 12. I will give them the last few dollars they need to spend a night at a hotel on the other end while they wait for their mother to come pick them up from Arizona. Chico Idaho Family. 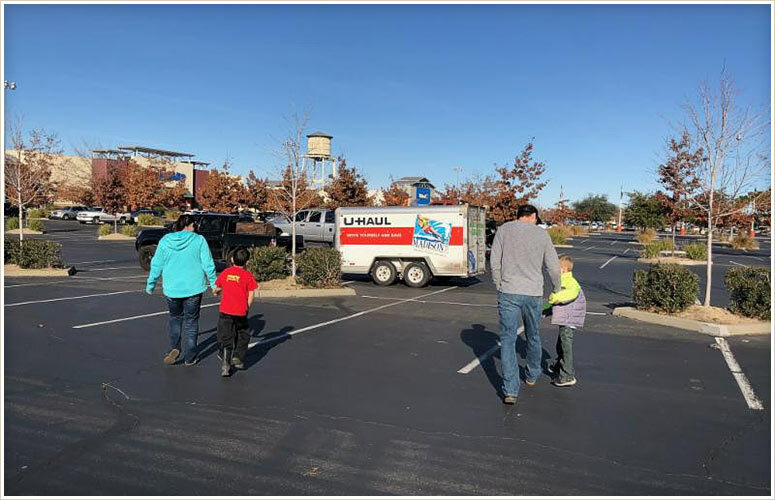 From the fire to Salinas to the Home Depot parking lot on Truxel Road, your donations have helped them with gas money and a hotel as they made their two day journey to Idaho to start a new job and a new life. Chico Shelter Janice with Small Dog has had her car payment and insurance paid for two months. They lapsed during the fire. We agreed that she would remain in the shelter where she is safe and warm. I will meet her on the 6th to give her $100 in gas money. She’s leaving to go live with her sister who has prepared a room for her. Magalia Smiles got a donated car last week. You’ll remember him in previous emails. I handed him gift cards while standing in the ashes. He’s staying at a room in Chico. I’ll keep you updated. I’m working with a trailer park near Pastor Doug’s church. 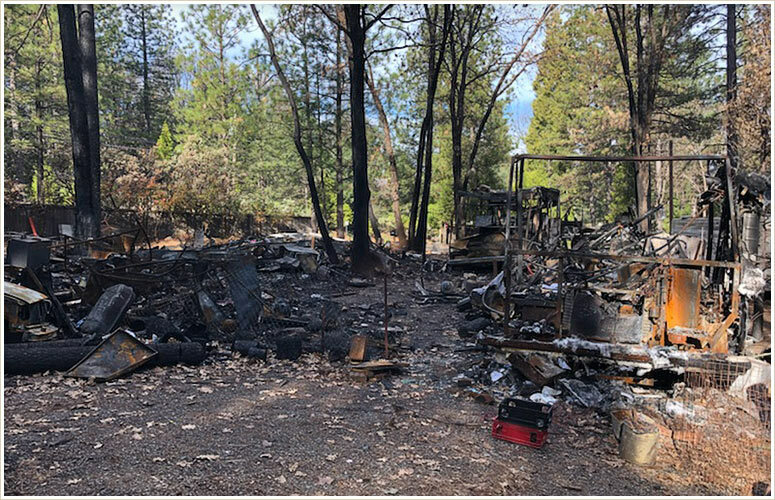 The folks who currently own it bought it two months before the fire and also lost their homes. I’ve made a commitment to them to revamp the trailer park by helping them find renters who can pay the rent. The trailer park was on the State’s radar as far as being full of meth labs. The fire solved that problem. I’m going to help the owners fill it with great people and make it a shining success of Magalia. We have our first trailer going in. There are four slots here for trailers. A fifteen day notice of abandonment has been posted per State law. Once these slots are cleared, we have people in trailers with jobs to move in. I don’t know where this journey goes, but I will keep going as long as there is need and as long as you, my partners, continue to support this journey. I am still coming across people in desperate need and we are still finding solutions. Understand that without this partnership between you and I none of this happens. None of it. I can go through every alphabet in my contact list and tell you the people and the stories and the outcomes that your kind giving has allowed to happen. Our annual Wings & Wine event will take new flight this year. All proceeds will go to support our effort in Magalia and beyond. We will also be supporting Wildlife Care Association. I hope you can attend and I hope you will support these worthy causes. Tickets can be purchased by clicking here. You and I have started on a journey together that has been sad, humbling and full of triumph. It’s been life changing being so close to it. I wish I could share it all with you. There’s a new year ahead. A new year of hope. I can’t tell you enough what this partnership between you and I has meant. As hard as it has been, it is also been extremely gratifying to watch people take their lives on with a newfound courage they did not think they had. Don’t ever question the human spirit. The support all of you have given to this journey has kept the human spirit alive and well.